The group got a loud ovation as they entered the court, which was rapidly filling because of Nadal's overwhelming star power in South Florida. World number one Rafael Nadal had no such troubles, however, as he reached the third round with a 6-4 6-4 win over Japan's Kei Nishikori. Nadal, who has not won a title since October, looked in control thoughout the clash and served out to love after one hour and 48 minutes. "It was one of those first rounds you don't want to see," said the Spaniard. "I'm very happy about how I played today - I was at a high level tonight. "The feeling was better than last week, so that's important. 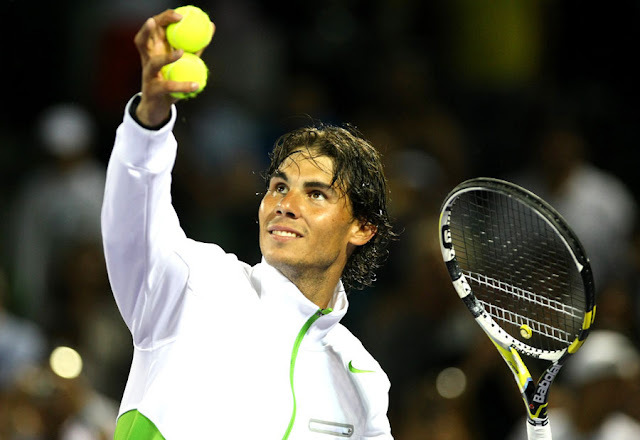 The serve worked very well at the end of the match."